Make the most of a smaller space with this round dining table. Two drop leaves on either side of the table create flat edges to make it even smaller when you don't need the full table. This smaller table is ideal for an apartment or kitchen dining area, and the drop leaves allow you to maximize your space by lengthening the table only when you need the extra space. Solid wood and a rich brown finish make this a sturdy and timeless piece for your home. 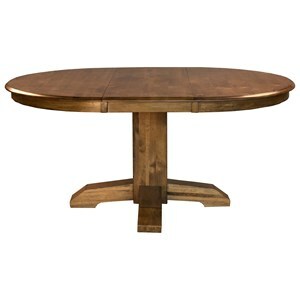 The Mason Round Drop Leaf Dining Table by AAmerica at Gallery Furniture in the Oregon, Portland, Clackamas, Washington, Beaverton, Northwest, Vancouver area. Product availability may vary. Contact us for the most current availability on this product. Create a rustic modern look for your dining room or kitchen with a set from this dining collection. Featuring a Macciato brown finish over solid wood, this group offers timeless, quality pieces for your dining area. Table, chair, and stool options make it easy to find the perfect set for your space. Upholstered seats and and table leaves offer even more comfort and flexibility to perfectly fit your home and entertaining needs. An updated traditional take on mission and rustic provide this casual look for your comfortable and inviting home. The Mason collection is a great option if you are looking for Rustic Traditional Casual Mission furniture in the Oregon, Portland, Clackamas, Washington, Beaverton, Northwest, Vancouver area. Browse other items in the Mason collection from Gallery Furniture in the Oregon, Portland, Clackamas, Washington, Beaverton, Northwest, Vancouver area.